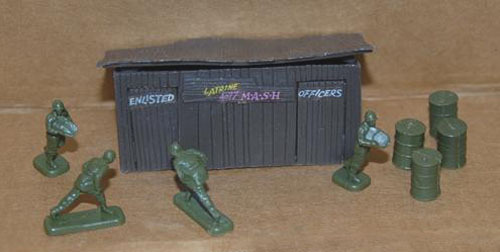 Zee Toys, a trading name of Zylmex, was an American company that made a wide variety of toys. 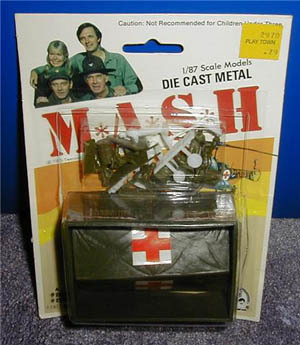 One very small part of that was a series of products based on the MASH film and television series of the 1970s and early 80s. 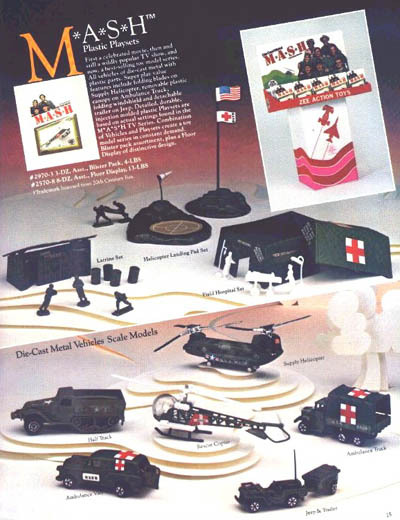 Below is a page from their catalogue showcasing this range, which included vehicles, helicopters and, most importantly, some figures in approximately 1/72 scale. 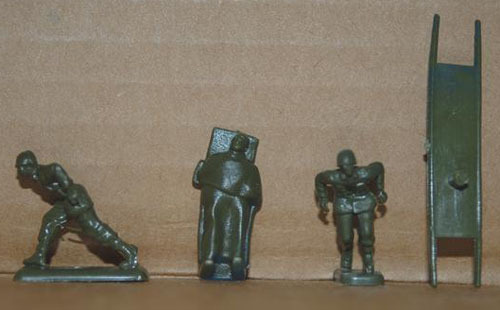 In this article we will take a closer look at the three products that included these Korean War figures. The first and surely the strangest of the sets is this one. It included a latrine with detachable roof, four oil barrels and four figures. 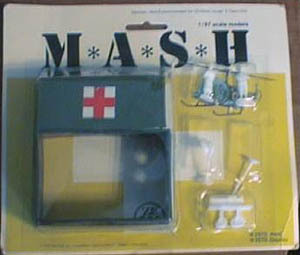 The man holding what might be a bedpan looks similar to an old 1/35 scale Monogram figure, while the rest look unique. 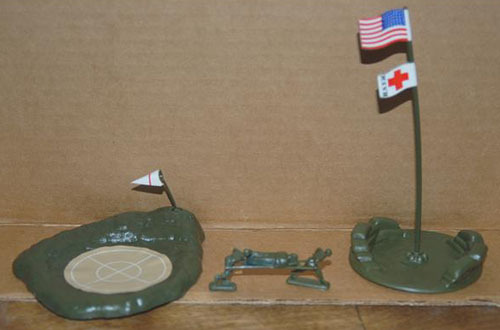 The bedpan soldier seems to be wearing the M42 HBT fatigues common to Korea and late WWII. All the other soldiers appear to wear the M43 fatigues, with the jackets going past their rear ends, which is close to accurate. They all also wear the M1923 cartridge belts. 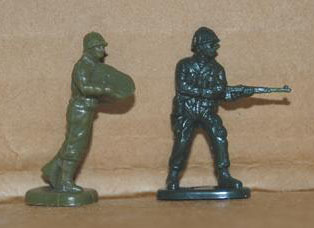 One of the poses looks similar to the stretcher bearer, but his arms are slightly different, and he has no ring hands. 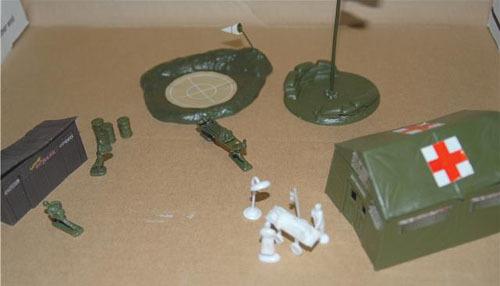 Next we have this set with its stretcher party, helicopter pad, wind sock and sandbag bunker with flagpole. 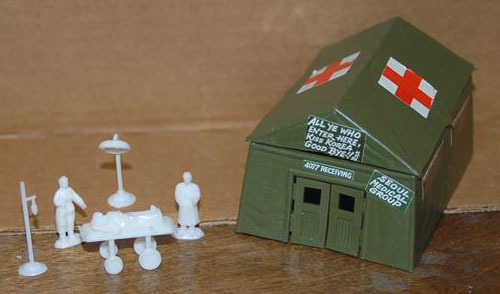 The last item is the most obvious - a field hospital. 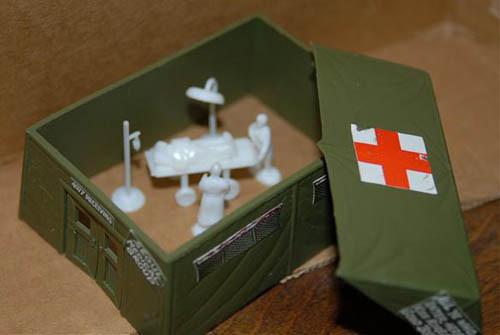 This has a great 2-piece medical tent with detachable roof, operating table, wounded man, doctor, nurse, intravenous bottle and operating lamp. The detail on all these figures is typical Hong Hong-esque, which is to say not particularly sharp. The tent, latrine and flags came with the stickers already applied. The blister cards claimed these figures were 1/87, but they are actually really close to 1/72 scale, though maybe more 1/76. 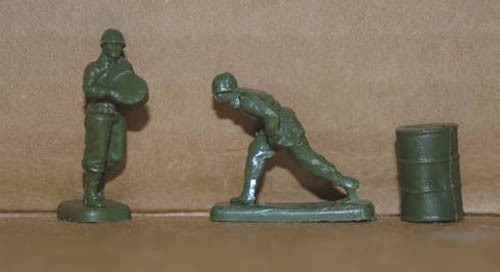 Below is a comparison with an IMEX Korean War US Army figure to illustrate that these are a good size match. 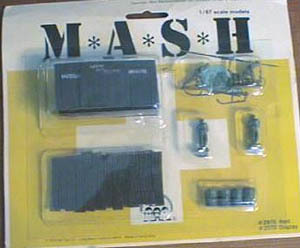 Below are some examples of the packaging.